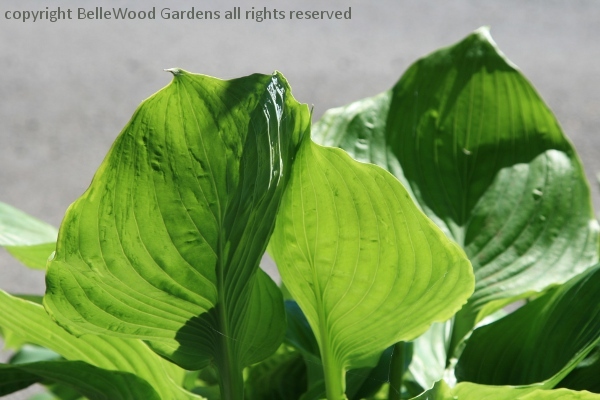 It's like this: Sally mentioned, several times, that she really wanted hosta 'Empress Wu'. Why? Well, it's very large, ginormous actually, reaching 4 feet tall and making a clump 5 to 6 feet across. 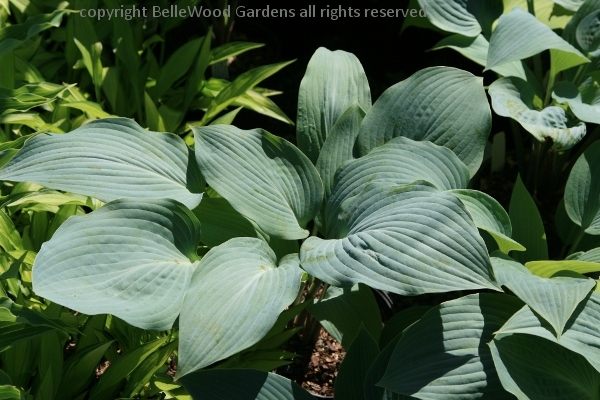 Now if you'd ever seen Sally's garden with fat and happy hosta making large mounds and over-running any neighboring smaller hosta you might wonder why yet another even larger hosta might be needed. Why? Because. That's reason enough to climb Mt. Everest - because (it is there.) So reason enough to acquire the empress. Because she exists. Next question, where to find her. That's easy. 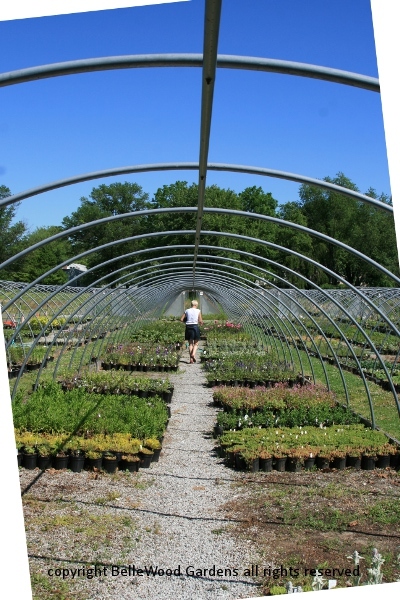 We'll go to Russell Garden Wholesale in Pennsylvania. Day and time selected, Sally offered to drive if I'd come to her house. Better yet! GPS informed of where we wanted to go off we set, chatting happily along the way. It seemed a rather lengthy ride but I hadn't been there in a few years. Eventually even though we were on New Road we came to a T-intersection and it was clear something was not right. Wrong New Road. I'm still not clear if they are in Southampton, Northhampton or Richboro. But we were close, only a few miles out. Sally phoned, directions were given, and we arrived. Of course we first went to the garden center and had to reverse three driveways . . . . We arrived. that makes it clear just where Alan's heart lies. First things first. 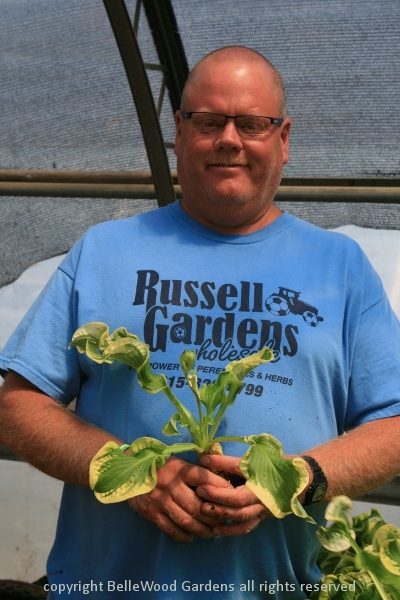 Alan was sure we wanted to see some new hosta that had just come in. And I mean just. They were still in the plug trays they'd been shipped in, not even potted up. 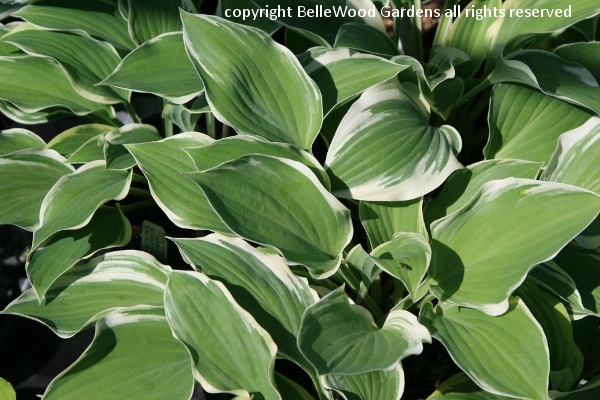 Meet Hosta 'Wheee', with the most ruffled, elongated white-edged green leaves you've ever seen. 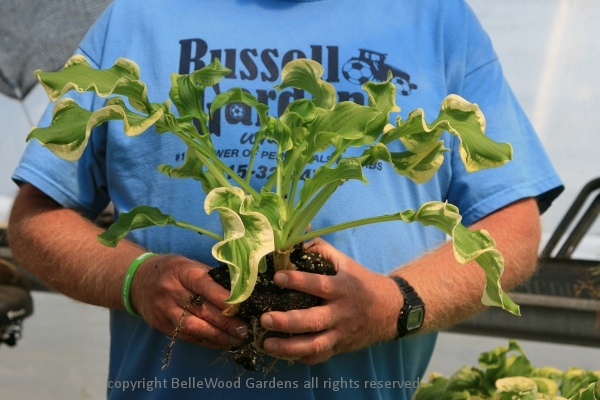 I love the way Alan is gently cradling this hosta in his hands. Of course I had to have one. Sally, well, Sally had to have two. Hoop houses for the sun lovers are uncovered for the summer, down to the skeleton of metal arches. 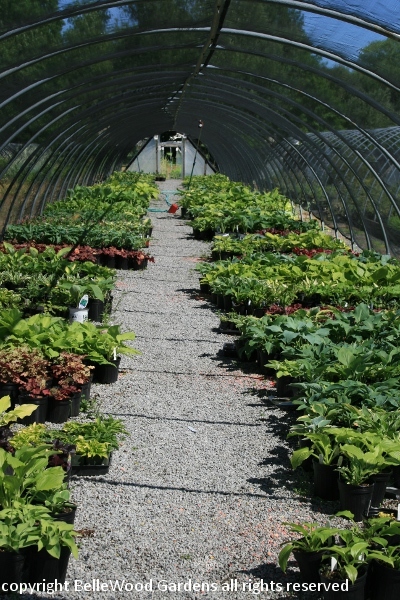 Those for hosta and other shade tolerant perennials have shade cloth over the framework. 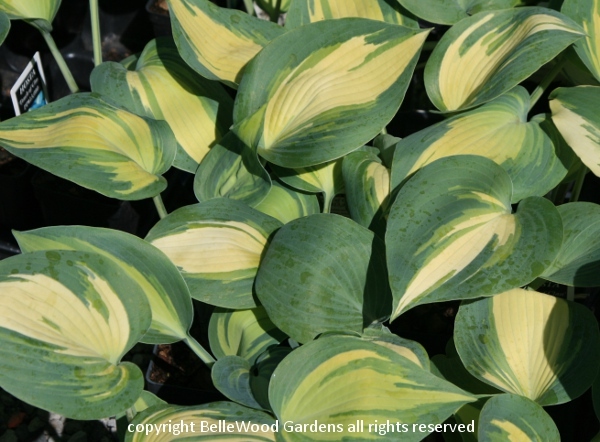 Hostas, many, many, many more than those listed on the web site are arranged alphabetically down the central aisle of house 26 / 27. Glaucous blue, white edged, white centered, yellow edged, yellow centered. Substantial leaves, others with leaves the size of my thumbnail. 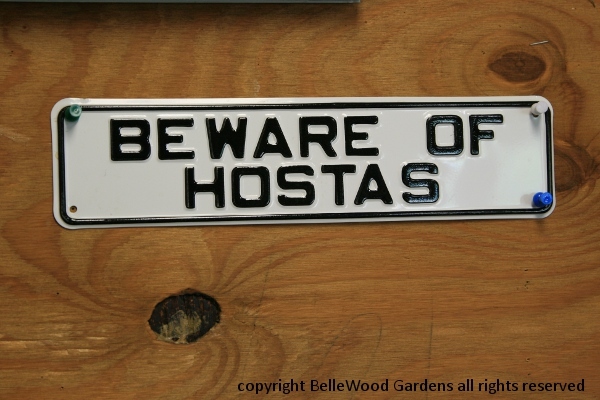 As the sign says, "Beware of Hostas." I came to keep Sally company. I came home with nine new hostas.